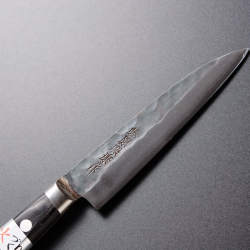 Petty knives are small utility knives of Japanese design for delicate work that a chef’s knife can’t handle, such as delicate produce and herbs, small fruits and vegetables. Pettys can vary significantly in both profile and size, ranging from 75mm to 210mm. Petty knives are very similar to the common western paring or utility knife. While there is no hard rule about where a petty and paring knife differ or what application each is most appropriate, pettys are often considered ideal for small and delicate tasks. Petty:This is the knife for smaller jobs that are done on a cutting board. Perfect for slicing shall..